Opening hours: Tuesday - Friday 11 a.m.-6 p.m., Saturday 11 a.m.-4 p.m. 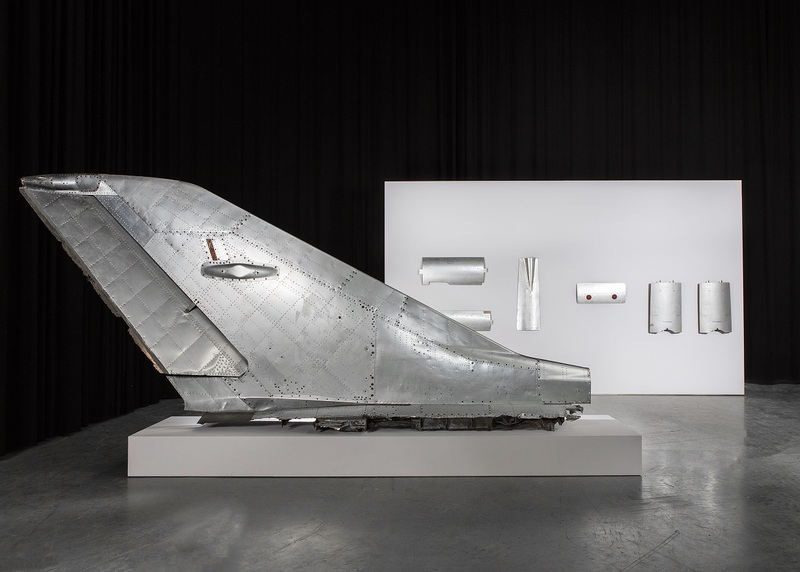 The gigantic rear wing of a Mig-21 is at the centre of WINGS, an exhibition that presents a portfolio of provocative works of art by world-famous artists at the Hotel Mond in Berlin. Bernd Reiter has set up the striking tail fin of the Russian Mig-21 as an enormous installation. This segment of a fighting machine stands in the midst of the exhibition space as a silent threat, telling a tale of a past in which it wreaked damage and triggered pain. Now and today, dismantled into its individual pieces, having seemingly mutated into an innocent and harmless work of art, the wing documents a story enshrouded in mystery, with a nearly aesthetic and radiant aura. Viewed as a political memorial, it is primarily representative of the evils of current crisis zones and interacts with the thoughts of its beholder. Corresponding directly at eye level with the Mig-21 tail wing are works by Roy Lichtenstein based on comics as their raw material, the way his Whaam corresponds to All American Men of War. These works catapult the beholder into the 1960s world of energy, violence, eroticism and modernity, yet they are not war stories. They are abstract images with bursts of fire reminiscent of Pollock’s action paintings – phenomena the beholder must explore for him- or herself. series create an eerie attention that distinguishes Rauschenberg’s fascination for texture, finish and reflection. His works can be equated to a television channel in which one can experience the diversity of the consumer world – from war to science – without having to change channels. Between Rauschenberg’s and Reiter’s works, a very unique tension arises between the whole and the individual parts of an extraordinary story. Like Bernd Reiter, Banksy is also a political artist and activist whose works are critical of the consumerism, society and the system in which we life, shedding light on the world in the form of caricature, making them morally judgemental. His work Rude Copper is reminiscent of the old bobbies on the beat; it makes a mockery of British police work and its attitude and arrogance, while Radar Rat is a pure anagram of art. Contrary to the exaggerated works of Banksy, Damien Hirst dedicates his art to timeless themes such as death, religion or love and markets consumer culture for Everyman. The boundaries are fluid here when it comes to the question: Who is the consumer, and who the product? He describes the Spin works featured in the exhibition, which date to Hirst’s youth in the 1960s, as psychedelic compositions and as psychedelic compositions and as "childish ... in the positive sense of the word’. Keith Haring’s Radiant Baby, also called Radiant Child or Radiant Christ, first appeared in his work as a subway artist, where he used it as his brand or signature. Haring described the radiant baby as the ‘purest and most positive experience of human existence’. It is largely symbolic of ‘Haring’s hope for the future,’ yet its meaning is ambivalent: the beholder cannot be certain whether the baby will be consumed by the flames or save humanity. While Reiter’s war machine, the Mig-21, actually destroys people, the beholder can at entertain the hope that Haring’s radiant child could save people. Ailerons, rudders and wing flaps all serve to create resistance. When deployed, they cause an aircraft to change direction or altitude. In much the same way, the exhibition WINGS creates a controlled art shock and combines postmodern illusions of consumerism with the irony of contemporary political activism. The rupture in which this results is meant to create upset and calm at the same time, and to contribute towards generating a new awareness of authenticity in the self-branded world.